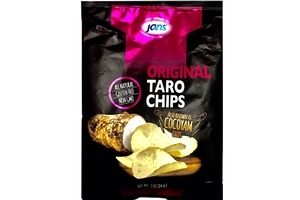 Jans Taro Chips Original (Cocoyam Chips) in 2.96oz (84g) bag. Product of Indonesia. All Natural ₪ | No Preservative ≠ | Gluten Free √ | Non GMO | Halal Certified حلال . We are keeping it simple here. Our original Jans Taro Chips are made with thin slices of taro, steadily cooked and seasoned to highlight their natural flavor. A tasty spin on classic snack, its healthy and delicious choice for movie nights, after school appetites or those late midnight cravings. These taro chips are made from root of and exotic tropical plant, which make them lighter than regular potato chips and prefect snack to satisfy that crunchy craving. They are all natural, gluten-free, also have 0 grams trans fat, making them the perfect healthy treat.